The Jasper 120 tract offers a good timber investment in young, fast- growing pine plantations, which comprise 86% of the tract. The property also offers recreation through hunting in an area known for high populations of deer and turkey. The tract contains approximately 120.7 acres of which 115.3 are forested. 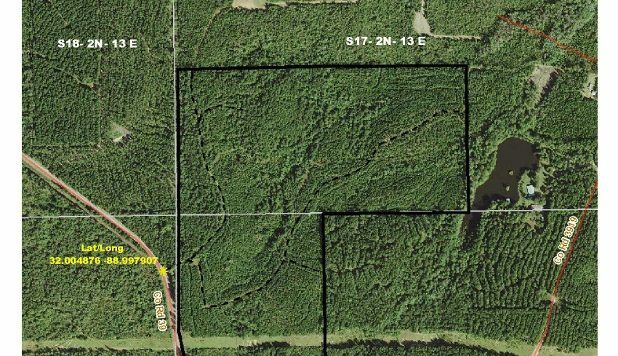 The property is located in east central Jasper County about eight miles north of the Heidelberg community and 31 miles southwest of Meridian. It is approximately 95 road miles southeast of Jackson, Mississippi and 21 miles northeast of Laurel (see Location Map). It has a few hundred feet of paved road frontage along County Road 39. Two woods roads provide interior access. The combination to the lock on the gate is 4006. Jasper 120 is located about one mile southeast of Jasper 350, which is also for sale. Three types of timber are found on the tract. They include about 29 acres of 1992 pine plantation, 74 acres of pre-merchantable 2008 plantation, and 13 acres in natural stands of pines and hardwoods. In addition, about three acres are in a gas pipeline right-of-way. The 2008 plantation currently supports about 544 pine trees per acre. The mixed pine/hardwood stand is found in three areas, and it is about 70 percent pine and 30 percent hardwood. Topography ranges from hilly to steep. Elevations range from 430 to 570 feet above sea level, for a total change of 140 feet. A ridge runs along the west side of the tract. There are no creeks or ponds on the property. Note, the owners of this tract have a total of six tracts for sale. They are Jasper 120, Montgomery 420, Montgomery 133, Clay 310, and Webster 160.